Try a creative tea party table setting when hosting your next luncheon with friends. 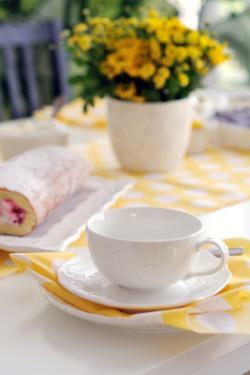 Make the day an elegant experience for all your guests by knowing the proper way to host a tea and set the table. 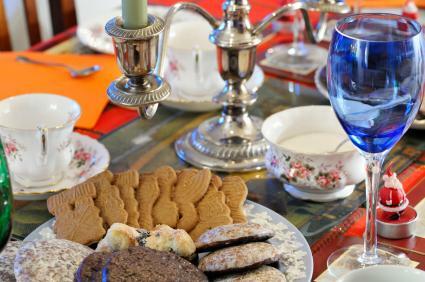 A Victorian tea party is a traditional theme that is formal and follows the rules of an old English tea. To set the table, use fine china and antique tea pots. Tables can be decorated with lace tablcloths, lace doilies under each cup, flowers and candles. Use a silver candelabra as the centerpiece. These parties occur in the late afternoon and feature a traditional menu of tea sandwiches minus the crust that are filled with cucumber, watercress and salmon. Scones are also served along with clotted cream and lemon curd. Each princess can have a gift bag filled with toy jewelry as a favor and as part of the tablescape. A tea party can be used for a birthday celebration. You can add balloons to the table and use a small birthday cake as the centerpiece. Use the guest of honor's favorite colors as the color scheme. Scatter confetti around the table and place a birthday hat on each dish to serve as a party favor. Turn an ordinary baby shower into something spectacular by using a tea party theme. If the expecting mother knows what she is having, use either blue or pink as the color scheme. If the mother is unsure, you can use a mix of pink and blue or go with a unisex color such as yellow or green. Each table can be decorated with teacups, dishes and napkins as well as baby shower favors. Use small bouquets of fresh flowers on the center of each table for a simple and sweet accent. Instead of using napkin rings, choose cloth diaper safety pins to fasten the napkins together. Since there are many styles and patterns when it comes to teacups, there is no set rule that all of your cups have to match. It can be interesting to have mismatched settings at your table. Use a mix of antique cups or cups with various themes to add an element of interest to your table. A gingham tablecloth in a color found in the mismatched cups, with matching ribbons tied around chair backs, adds to the country charm. Depending on the season, your table setting can go along with a holiday theme. If it is around Christmas, use Christmas teacups and place a poinsettia in the center of the table to serve as a centerpiece. You can serve holiday flavored teas as well. During the Fourth of July, consider a tea party with a red, white and blue theme. Use striped cloth napkins with red and white or blue and white. Plan a centerpiece with cheap but pretty carnations in red and white with blue star scattered throughout the piece. For a tea party in the summer, use fresh flowers that are in season for your centerpiece and select colorful teacups to brighten up the table. Yellow, bright purple, red, and fuchsia are good choices. In the fall, consider using an autumn leaf motif on the tablecloth, and tying napkins with raffia. Mums make an excellent centerpiece. Rich golds, reds and oranges are perfect for this season. Putting decorative place mats for each guest at each setting. 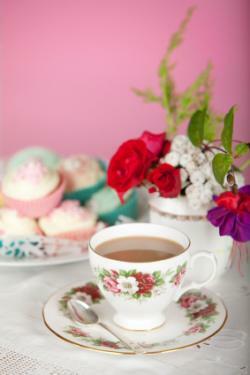 Always place the teacup to the right of the place setting with the teacup's handle pointing out. Place a saucer under each teacup. Place a fork to the left of your plate along with a napkin. The spoon and knife are placed to the right, making sure that the knife blade is facing in toward the plate. In addition to the teacups, a water glass can also be used. The water glass should be placed just above the knife. Use a lunch size plate for a tea party instead of a large dinner size plate. Keep food simple. Tea sandwiches, scones, cookies or anything light and refreshing are all great choices. Have sugar and cream on the table for your guests. Other additions to serve with the tea can be fresh lemon or mint. A final touch would be a place card in front of each setting. A handwritten card with each guest's name is the perfect special touch to your tea party table setting. If you need help downloading these printables, check out these helpful tips. 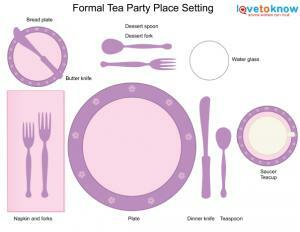 Download this formal tea party table setting. 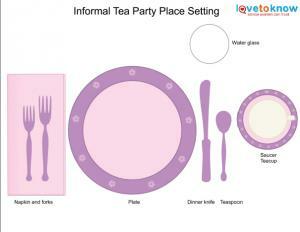 Download this informal tea party table setting. 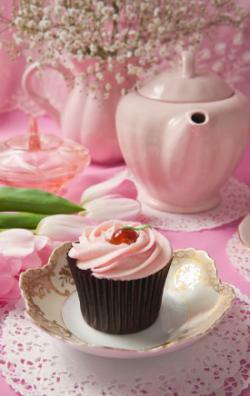 A tea party can be a great idea for any occasion, from baby showers to birthday parties. Almost any time you plan to get together with your friends is a great reason to host a tea. It can be a relaxing afternoon to sit back and talk over a cup of tea. Don't stress over the table setting; use what you have on hand, be creative and have fun.